Wow the crowd with a Blue Ribbon Layered Salad. 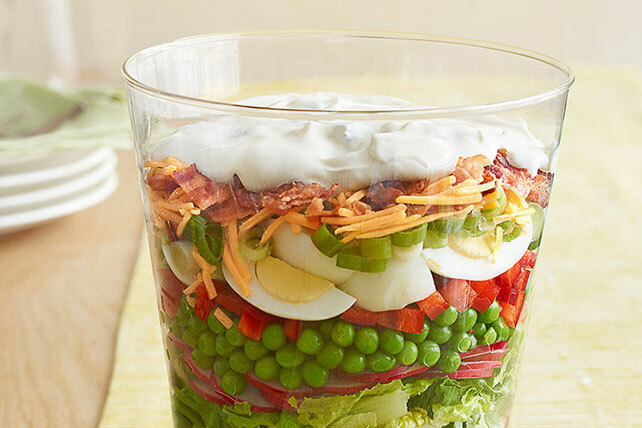 This Blue Ribbon Layered Salad includes hard-cooked eggs, cheddar cheese and crumbled cooked bacon. Save 40 calories and 6g of total fat, including 1.5g of sat fat, per serving by preparing with KRAFT Mayo with Olive Oil Reduced Fat Mayonnaise, and BREAKSTONE'S Reduced Fat or KNUDSEN Light Sour Cream.